Emetophobia is a pathological fear of vomiting, and despite being a relatively common psychological disorder (3-5% of the population are emetophobes) in the world of psychology it is fairly under-researched. 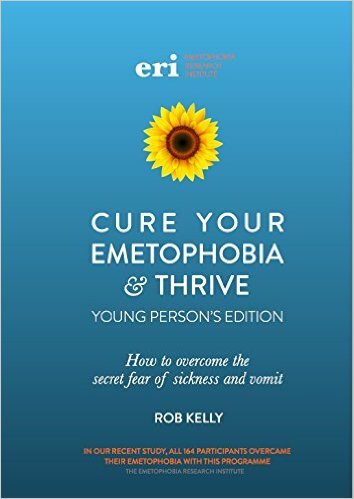 These specialised versions of The Thrive Programme workbook (Cure Your Emetophobia & Thrive or Cure Your Emetophobia & Thrive Young Person’s Edition 8 – 18 year olds) are dedicated to sufferers of emetophobia and was created by Rob Kelly and a team of researchers based at Cambridge University. Cure Your Emetophobia & Thrive is the ONLY predictable, research-backed, proven cure for emetophobia. No matter what age you are, you can overcome your fear completely. The programme is supported by extensive investigation and survey findings which can be downloaded here. 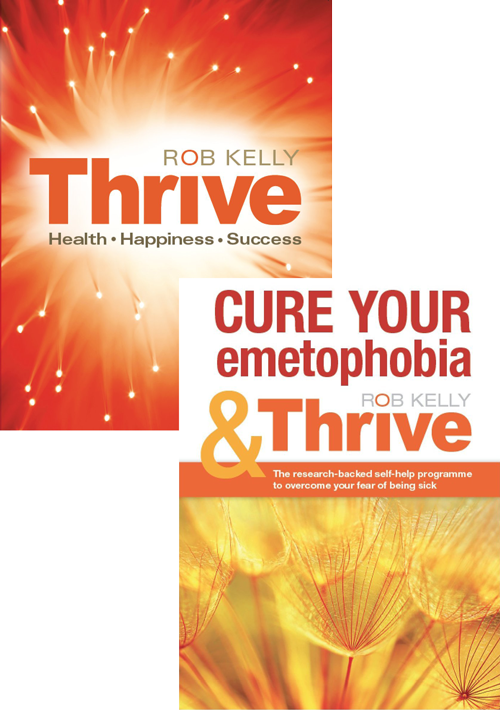 It is NOT therapy, and thus the most successful intervention for emetophobes with emetophobia expert Rob Kelly an authority on the subject, leading seminars worldwide for sufferers. The 5th of March is National Emetophobia Awareness Day (NEAD), and you can watch the official 2014 presentation filmed at The Royal Society of Medicine here. The success of the book in helping sufferers to cure themselves is evident within hundreds of published client testimonials and significant press and journalism coverage (please see my Blog page to read ex-emetophobe Mary’s story). In the case of all phobias, a high desire for control in any situation where the sufferer feels out of control, limits the response to an unhelpful one whereby the belief to avoid the risk is processed disproportionately to the actual threat. Emetophobes in particular, will exhaustively engage in safety seeking and avoidance behaviours, with the intent to protect themselves from any situation associated with sickness that they find intolerable. Feelings of fear and anxiety accumulate to intensity making for a particularly intrusive phobia which sufferers often find difficult to tackle with treatments such as exposure therapy, cognitive behavioural therapy, and indeed other self-help approaches. Many emetophobes are disempowered by their belief that they cannot overcome their fear, and previous attempts with unsuccessful therapies reinforce the myth, that at best, sufferers can only learn to cope with it. 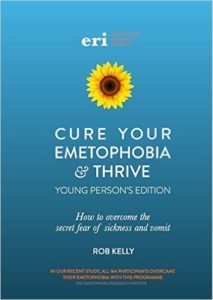 Cure Your Emetophobia and Thrive however, comes from a completely new direction and is highly suited for emetophobes; tailoring the Programme to specifically seize the problem, whilst exploring exactly how and why the practical exercises and techniques are so valuable. 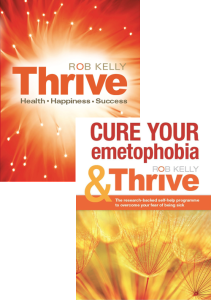 Cure Your Emetophobia and Thrive shares the same ethos as the main Programme; encouraging a healthy level of control over life in order to Thrive free from symptoms, fear and worry. The teachings of cognitive understanding and self-awareness for symptom resolve, are of the utmost importance in learning to Thrive, and these values are just as prevalent for emetophobes with this version of the workbook. Sessions corresponding with this book can be undertaken via my practice room or Skype and are conducted in much the same empowering way as the main Thrive Programme book, utilising the skills and internal resources of the client. It enables sufferers to really understand the importance of their cognitive processes, and to realise that the way they think, feel and react to situations has a profound effect upon how they view and experience life. If this specialist Programme relates to you and your emetophobia, or somebody you know, please get in touch for more information about how to finally rid yourself of this debilitating phobia.